Extracted :- In Sarawak, Chief Minister Abdul Taib Mahmud will deliver 100 percent of his PBB seats to the BN and hence secure the majority of Sarawak seats. However, the PRS and SPDP may lose a couple of Dayak seats to PKR. The SUPP will come under a strong challenge from DAP and could lose all its Chinese majority. SPDP seats he said under threat are Baram and Mas Gading. Saratok will see some resistance. However the good work and “personal touch” by the Puteri’s led by Puteri Chief Barbara Mawan plus some of the Putera’s have made inroads in the Malay area of Kabong and Paoloh.They have spent countless hours in their time and devotion to the party to ensure it remains a BN seat. Bintulu will have some little ‘hiccups” in the Chinese areas but overall it remains a BN stronghold. SUPP will see DAP making inroads in Miri,Sarikei,Stampin,Lanang and SUPP has an uphill tasks in Bandar Kuching but pulling a surprise win here is not impossible while Sibu will be 50:50 and Serian the Bidayuh’s still have a soft spot for Richard Riot and he has looked after his constituency well enough to be voted back in. PRS as of now will see at least three- cornered fight in all their allocated 6 seats with PKR and SWP joining in. PRS under threat seat would be Hulu Rejang where the infighting can and will escalate if Billy is renominated and PKR would use this to wrestle the seat away. Sources on the ground are also anticipating a bitter fight in the area where the SWP President will be standing and PRS will not relinquish their seat so easily. Localised flavoured issues will still be the ‘main dish” on the menu eventhough the electorates are going for the General Elections. The pick of a ‘winnable and popularist” elected representative will still swing the votes for many Sarawakians. The upcoming 13th general elections will be a much-anticipated, most exciting and nail-biting election in the country’s history. There are 222 parliamentary seats in the country, of which about 150 are Malay/bumiputera seats, 30 mixed seats and 42 Chinese-majority seats. 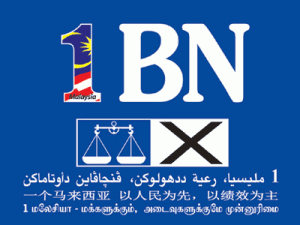 In the 2008 elections, BN won 140 seats and the opposition won 82 seats. A further breakdown shows that Umno won 79 seats, MCA 15 seats, MIC 3 and Gerakan 2, PKR won 31 seats, DAP 28 seats and PAS 23 seats. From our analysis, it is becoming quite clear that the rural population has largely returned to BN, in particular rural Malays has largely shifted back to Umno. In this regard, Umno is expected to win more seats than in 2008. It is likely that Umno may win 85 to 90 parliamentary seats, up from their existing 79 seats. There is also a clear trend that Indian voters in rural and semi urban areas have also shifted back to BN. However, the urban voters are largely still with Pakatan Rakyat. Even though urban Malay voters may support Pakatan and even if more urban Malays were to support Pakatan in the urban seats, it will not increase seats for Pakatan as these urban seats are already held by DAP. However, the urban voters are still very much with the opposition in particular. The urban Chinese are very strongly supporting the DAP. Some older Chinese and the Chinese business community may want to give Najib a chance. They value peace, stability and prosperity and like Najib‘s engaging style, like his presence at the Dong Zong Chinese New Year Open House. These have caused frustrations among the Chinese voters. However, if the Malay and Indian swing back to Umno-BN is strong, it will help MCA and Gerakan in the mixed seats where Malay voters account for higher than 40 percent and Indian voters are between 10-15 percent of the constituencies, such as Padang Serai and Gopeng. Najib will campaign from a position of strength. His popularity and personality and his hard work and tenacity can win him a lot of support. Obviously, he is more popular than his party. Najib’s proven track record in the transformation programmes and economic performance with the 6.4 percent GDP growth in the 4th quarter of 2012 stands him and the BN government in good stead. On the other hand, MCA has a good chance of winning back Padang Serai, Gopeng and Selayang should there be a strong Malay and Indian swing back to BN. In the state contests, Pakatan should retain Kelantan and Penang but will face a strong challenge from BN. In Penang, if the Malay swing is strong, Umno may win 17 Malay seats and if MCA and Gerakan can win just four more seats, BN will narrowly regain Penang. Margin of BN’s victory uncertain In the final analysis, the BN will win the 13th general election. The only uncertainty remains in the size of the majority. From our analysis, BN is expected to win between 123 to 135 seats. This is the most likely outcome. However, if the Malay and Indian swing back to BN is very strong and Najib is able to bring back more undecided Chinese, BN can win up to 150 seats, which will restore the BN’s two-thirds majority. This outcome will be a difficult challenge. The third scenario is the BN retains about the same number of seats around 140, which it won in 2008. Nevertheless what can be certain is that the two big winners in the coming elections will be Umno and DAP. What is also important to consider is the shape of the post-GE13 government. Will there be a new political realignment? Will Umno seeks a new alliance with PAS for Malay and Muslim unity? How will this impact on the non-Malays and non-Muslims? Will the two big expected election winners Umno and DAP seek a new political realignment? Nothing is impossible after the general election. After all, there are no permanent friends or permanent enemies in politics. These are the sort of post-election scenarios that need to be also considered. However, when the next question came it was more straight forward,”Your party SPDP fielding Barbara Mawan what do you think?” Aduh! Hai,Eee how do we get out of this situation? Furthermore we also know that 18 out of the 31 Parliamentary Seats the women voters exceeds the male voters.Great !! we got it right there when we answered the YBs and MPs. They reminded us to please check up the statistics. These are the statistics from SPR which we checked,” 1,069,654 voters in Sarawak 534,516 which makes up 49.97% are women voters. Are we going to be drawn in a gender warfare but being party members in SPDP we too need to protect our party’s interest and not to let the opposition have a field day. If anything PKR and Pakatan have already penned in their candidate Assemblyman Ali Biju to stand as a candidate in the forthcoming Parliamentary elections. 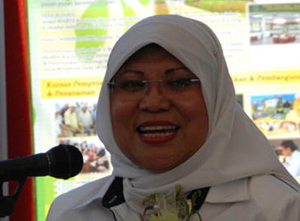 A source cloes to the selection committee in PKR said they were also toying with Puan Nurhanim Datuk Mokhsen Ketua Wanita Sarawak to be fielded in Saratok but decided otherwise. Only during nomination day we will know and before the names are on the nomination papers there will still be lobbying done. Even if you have printed your posters it doesn’t necessarily mean you are chosen as there might still be some political twists and turns. What actually started this conversation? It had something to do with William Mawan President of SPDP rumours which have put him in the forefront to be a candidate. We also wrote on February 5th “Mawan Whitens Saratok” It did turn to Barbara as they all know her well enough to say a thing or two about her. Of course for a cup of coffee we would tell you but not here in cyberspace. SIBU: Speculations on the Barisan Nasional (BN) candidate for the Saratok parliamentary seat should cease and the focus channelled towards ensuring it remains with the party. 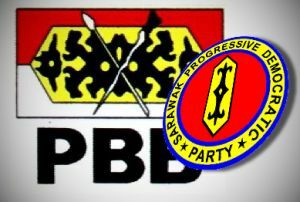 Sarawak Progressive Democratic Party (SPDP) supreme council member Chambai Lindong said on Friday that in the true spirit of BN, any differences should be put aside to prevent the opposition from exploiting issues to their advantage. “Now is not the time to speculate. Our Prime Minister Datuk Seri Najib Tun Razak has been moving around to ensure everything is in place and this shows that the election is very near. “What is of utmost importance is for all members and leaders from grassroots level upwards to work in a concerted manner, reinforced by strong support from other BN component parties to retain the BN’s stronghold this impending election,” Chambai told thesundaypost. He was responding to a news report which claimed members of BN component parties in Saratok wanted the ruling coalition to field more women candidates in the coming election. It quoted Nasir Manap – Parti Pesaka Bumiputera Bersatu (PBB), Hossin Sulaiman and Lim Kieng Huat – SPDP, Roland Angking – Parti Rakyat Sarawak (PRS) as well as Lau Pun Hui and Wee Lee Gua – Sarawak United People’s Party (SUPP) as saying they wanted a woman candidate to be fielded in Saratok. They claimed this was in response to Najib and Chief Minister Pehin Sri Abdul Taib Mahmud’s call for a big victory for BN this election. “That statement purportedly came from certain people, comprising certain councillors and certain individuals, and that is about all. To say that certain people would like to see a woman candidate for BN in Saratok is a valid expression of choice of preference,” said Chambai. However, he said the statement was rather vague and should have been backed up with details from the party divisions concerned. “I believe this is an individual’s impression rather than party’s opinions. I am not saying that they are wrong as they expressed their view on their preference. On speculation that he was among the several names said to replace incumbent member of parliament Jelaing Mersat, who is Deputy Transport Minister, Chambai laughed. “In all honesty, I do not know how my name came about but I guess with speculation you will always have more than one name,” he replied. 5 years on and just on the eve of GE13 the new propaganda machine from Pakatan is playing with numbers and driving fear into the hearts and minds of BN. Today this appears PKR leader Wong Chen talking to Malaysia chronicles ,”Pakatan as having a better than even chance of securing the federal government. PKR insiders believe that as many as 107 seats of out the 222 in Parliament are in the bag for the Pakatan, which also consists of the DAP and PAS. “We rather be cautious than over-optimistic. We are working very hard to win another 7 seats at least so that we can form a simple majority. Once that is done, we expect a huge crossover of BN Members of Parliament. Wonder what Pakatan will call this Propaganda next. Is there a similarity or is it just pure coincidental? In 2008 they said :- 916 when you add 9+1+6=16 and 1+6=7. Isn’t this another Propaganda Tool. ? The Golden opportunity will be 7 seats only next. 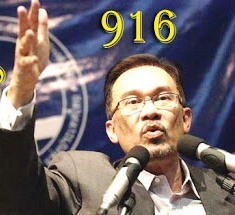 Anwar did we manage to derail yet another of your Propaganda of wrestling Putrajaya? Anwar knows that it is important to deceive the people as the people will put Pakatan into Putrajaya. Anwar has the story lines but he did not write the book. BN has authorised it to be published and yet another “switching sides” by BN Legislators will only be another failure as BN is on top of the game and is in charge of their own destiny. Anwar remember also its not Abdullah you are facing now but Najib. WE AWAIT THE FINAL COUNT. psst…You forgot my number Anwar…it starts with ….Call me as will be subjected for political strategic offers after GE14…Oh yeah !! pls remember mine is only in USD..